Cue the "Chariots of Fire" theme song: The Olympics are in Little Rock! To be more exact, the "American Champions: The Quest for Olympic Glory" exhibit is at the Clinton Presidential Center. 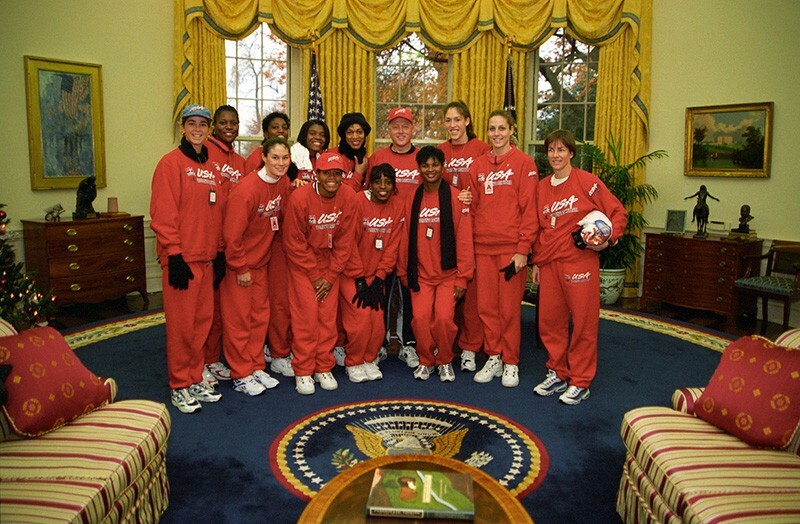 Clinton Family with 1996 US Olympic Team at the White House. 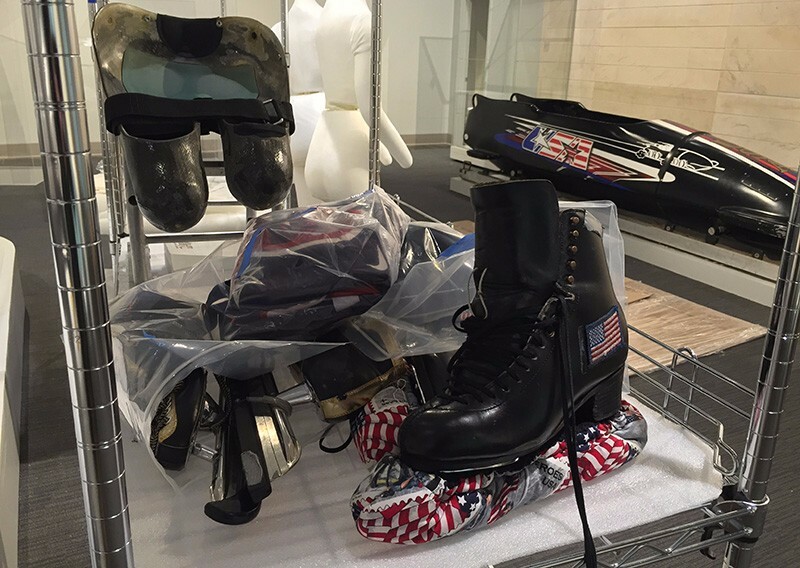 The exhibit tells the story of American athletes in the modern Olympic and Paralympic Games. Visitors see photographs, film, and memorabilia featuring Arkansan Clyde Scott, speed skater Bonnie Blair, tennis players Venus and Serena Williams, curler Shawn Rojeski and other American Olympians. 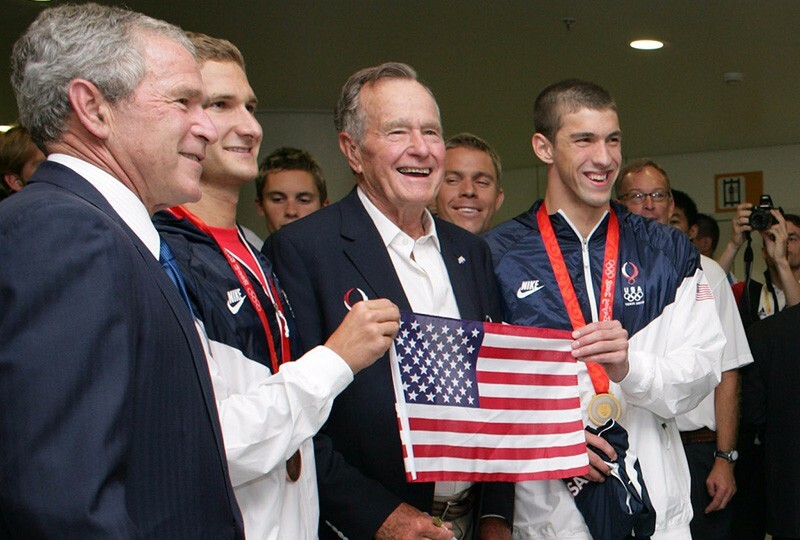 From left are President George H. W. Bush, President George W. Bush and Michael Phelps holding Old Glory. You'll find one gallery featuring the Summer Games and another focued on the Winter Games. Summer Games artifacts include the basketball signed by 1996 women's gold medal basketball team and presented to President Clinton, prototypes of the men's and women's gymnastics team competition uniforms, and a signed goal ball from the Athens Paralympic Games. Winter Games highlights include Peggy Fleming's dress from her 1968 gold medal Olympic performance, the Paralympic Nordic Ski used by Oksana Masters, and Brian Boitano's short program outfit from his 1988 gold medal Olympic performance. President Clinton and the 1996 Womens Basketball Team. The fun for families continues with a life-sized replica of the bobsled used by Team Night Train, the four-man USA bobsled team. Kids can even sit in the sled and take photos! Or, create your own medal ceremony on the replica of a three-tiered medal platform, set against the backdrop of a filled stadium. "American Champions: The Quest for Olympic Glory" will be on display through Sept. 11, 2016. For more info, visit ClintonFoundation.org/AmericanChampions. This article originally appeared on the Little Rock Family blog on March 10.